Despite being a fairly informal breakfast joint (indeed, I’d primarily describe Chez Elle more as a “coffee shop that also sells crepes”), Chez Elle has a particularly nice building; at one point in its history it was a theater (the Summit Theatre), and if you look around you can see many of the remnants of the ticket off, seating area, etc. More importantly, however, is that it has an excellent little outdoor patio with several tables for enjoying your coffee and crepes outside like a nice little French cafe. 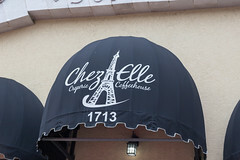 While it primarily seems to be a coffee shop, Chez Elle has a very nice menu of crepes, of both the sweet and savory varieties. They’ve got the classics, like the “Paris” (Nutella and Banana) or the Fromage (cheese and bacon), to some more interesting variations like Philly Cheeseteak (I think you can guess this one), the Tropicale (Coconut cream, almond brittle, custard, and tropical fruit), or some nicely nontraditional ingredients like the Chorizo Monsieur (filled with potatoes, topped with scrambled eggs, and served up with a chorizo cheese sauce). Indeed, the last of these sounded good, so it was my order. 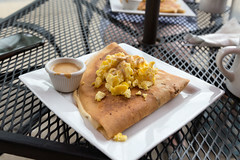 A few minutes later, sitting outside on the nice patio with a cup of coffee, they brought out my crepe: filled with a nice spicy potato mixture, having a nice savory buckwheat-style crepe, some nicely scrambled eggs, and a cup of the chorizo cheese sauce on the side, this was enjoyable; as I ate I’d spear a bit of crepe with potato and egg, and then dunk in the sauce. 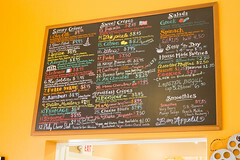 Overall, a pleasant breakfast spot with some really good crepe options in a pleasant neighborhood just outside of downtown, I wouldn’t mind coming back on future visits. (Closed) I’ve been a pho addict for almost 15 years now. Unfortunately, living in New Hampshire, I’ve got no local pho joints, and only two that are within an hour’s drive of my home. So most any time I’m traveling to an area with good Pho shops, I try and get a pho fix. 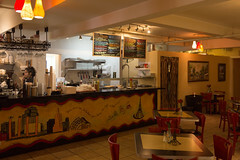 Phoenix is a particularly good area for Pho, with a large Vietnamese population. I used to have a favorite place up in Scottsdale by the Motorola plant, but it isn’t there anymore. Khai Hoan on Apache in Tempe is good as well, but wasn’t open on Christmas Eve this year, so we decided to give one of the better-reviewed places in Phoenix a try (19th Ave around Camelback has a number of Vietnamese businesses). We settled on Pho Bang due to a number of good reviews online, including two that mention that it’s John McCain’s favorite Pho joint.